one happy little crafter: Buttons, Bows and a whole lotta cuteness! Buttons, Bows and a whole lotta cuteness! Ok, so here's a question - is there anything worse in the world than the first day back at work after a couple weeks off - nope, thought not! But that's what my day holds for me...even though the last two weeks has been all about running around looking after the old fella, washing out his commode pot in the mornings, trying to avoid pot holes if I've taken him out in the wheelchair, and generally lots of pillow plumping.....but at least I've been able to fall out of bed at a more sociable hour than 5am, but hey-ho! who are offering a fab prize, so its well worth clicking the link, joining in the fun and checking out the other wonderful DT cards for inspiration! For my own DT card I plumped for another of the stamps that my lovely hubby got for my birthday...this time its Albie the Cotton Rabbit from Sugar Nellie. Isn't he a sweetie, I do have a fondness for animals in knitwear! He is coloured with promarkers, and image is mounted on a Nellie snellen die cut. The paper is from a brambly hedge stack. Also used: Ribbon, Rik Rak, twine and buttons. This is a gorgeous card Lisa, such an adorable image and lovely soft colours. I hope your first day back at work wasn't too bad. So gorgeous Lisa. The perfect papers to go with that adorable image and I love the buttons. I hope your hubby is making a good recovery and that work wasn't too bad for you today. 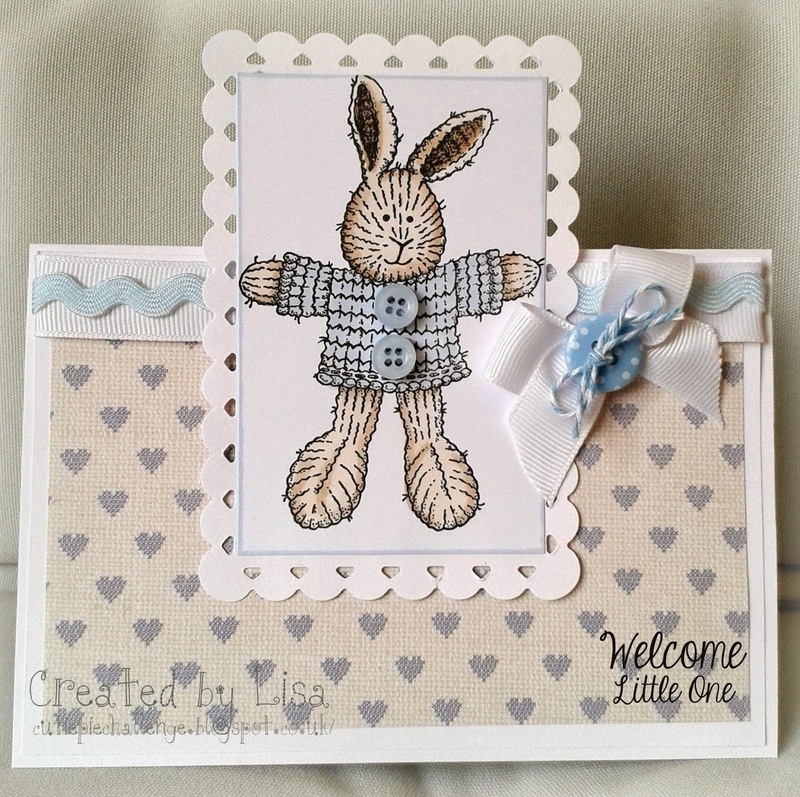 Love the gorgeous soft colours you’ve used, Lisa and that adorable image! Hello there from One Happy Mum!